– A private blog is available to your contacts. – Same contacts can be in different groups. – Shared items (folders and files) can be customized with a comment, picture, and ranking. 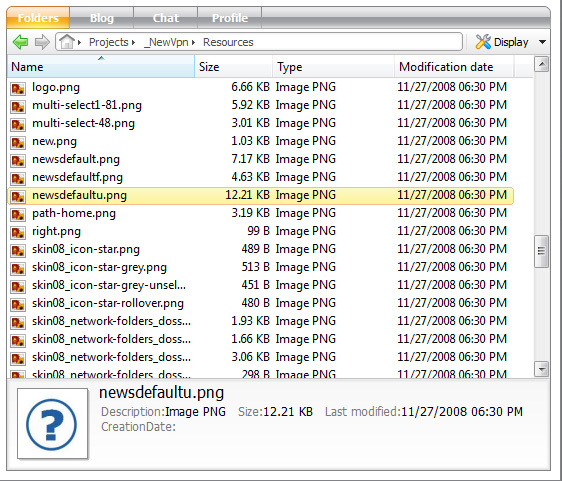 – Files recently added are flagged as “new” to help you check for updates easily. – Personal information can be added to your profile to describe your tastes, just like with a social network. The most obvious change will probably be the new user interface: Here is a screen shot of version 3 network tab. Here is a zoom on the folder window. This entry was posted in Version 3 release and tagged File sharing, GigaTribe version 3, new features, private p2p by D1FFER. Bookmark the permalink. Wow guys… some new options i really like..
— Files recently added are flagged as “new” to help you check for updates easily. The new lay-out also rocks.. Not the old ugly one anymore..
Will there also login server changes.. because sometimes there is downtime. Also gonna fix such problems? I really hope a tree browser has been added, because the current way of searching for files is a chore. les nouvelles possibilités seront très nécessaireet le design va vraiment dans le bon sens. Vivement la période de test. I can’t wait til this FINALLY comes out. Is version 3 available for download now? and if so how? Minor improvement to make things better for those of us in the UK…. Also why not make the column headings “dragable” like with Outlook Express, so that we can have the information displayed in what ever order we prefer. Comme Sam le dit j’espère qu’une arborescence en arbre sera ajoutée, cela faciliterait grandement la lecture. Bravo pour la page de lecture du réseau c’est un vrai plus de pouvoir y lire catégorie par catégorie le contenu et les mises à jour. Vivement la phase de test !